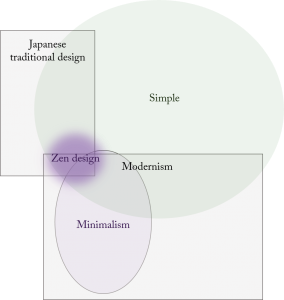 Zen-influenced art and design is often admired for its unique simplicity and minimalist approach. Although it is just one aspect of an entire Japanese traditional culture which stretches thousands years in history, it seems as if Zen ended up representing what the world perceives as “Japanese aesthetics.” How has one school of Buddhism become such a powerful force in the field of art and design? In order to understand the importance of Zen, it is helpful to divide Japanese culture into five historical eras: 1) From the introduction of Buddhism (538 or 552) to the Onin War (1467-1477), 2) The Onin War to the beginning of the Genroku period (1688~) of the Edo era, and 3) the Genroku to the Meiji Restoration (1868), 4) the Meiji Restoration to WWII (1945), and 5) the post-WWII era. Through this paradigm shift, one of the main teachings of Buddhism resonated with Japanese aesthetics despite the spiritual collision: 無常 (mujo, or “impermanence”). Buddha maintained that everything on Earth constantly changed, hence nothing was everlasting nor absolute. What we think is “A” today could become “B” tomorrow, even in those things whose consistency is taken for granted. Buddha further taught that we shouldn’t rely on external supports such as money, status, products or relationships to feel happy, because they could also disappoint you by changing or being gone tomorrow. The notion of mujo is also expressed by the word “空 (kuu),” which is core to the philosophy of Buddhism. The letter “空,” meaning “emptiness”, “voids” or “sky” is used in Buddhism to describe the awareness that everything, including us, is empty, and can only be defined provisionally by its relative relationships to other things (read more about “kuu”). In Japanese, 空 is also pronounced “utsu” to describe things that are empty, hollow and vain. There is another noun “現 (utsutsu)” that means “reality,” and there is also a verb “移ろう (utsurou)” meaning transition or change. Japanese people found beauty in “utsurou.” Rather than trying to keep real things real, or disguise empty things as full, they embraced the utsurou nature of things as they are. They spent enormous time and energy “observing” utusou things, appreciating moments that were real or beautiful. When those moments were gone, they used their memory or experiences to fill the voids. Ultimately, such an attitude helped cement Japanese aesthetics. The Heian era (794 ~1192) is probably the first period of time in Japanese history during which people questioned what Japanese aesthetics really were vis-a-vis Chinese ones. The aristocrats, who ruled the country (albeit the influence was still regional, centering on Nara – the Kyoto area) tried to blend strong, logical and structured continental values with domestic ones which were ambiguous, natural and subtle. By the 11th century, they invented their own alphabet (kana) by tweaking Chinese characters, which helped the emergence of kana-literature. 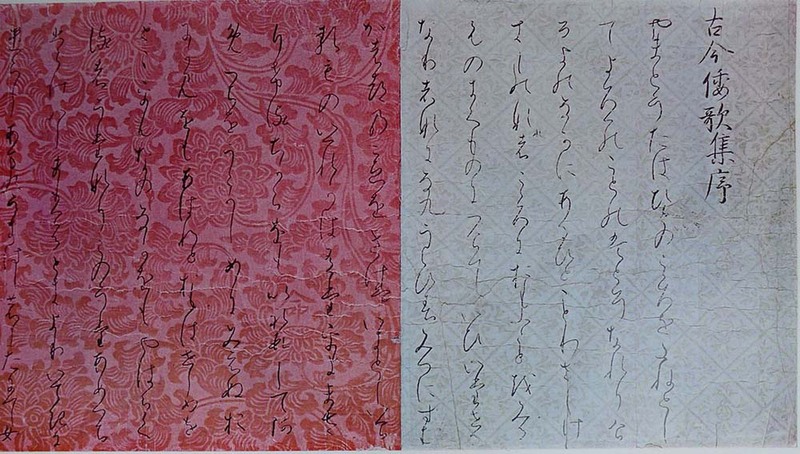 The contrast between the Chinese (top) and the Japanese (bottom) approach is obvious even in how letters are formatted and structured: whereas Chinese ones are solid and lucid, Japanese ones, called kana, are curvy, blurry and frail, even though they were created by adapting Chinese letters. Kana was, however, still considered unofficial and mainly used by women. Men used the Chinese writing system both for official and private purposes. In a sense, the Heian era can be regarded as a collision between a Chinese/masculine culture versus a Japanese/feminine one. Important points: 1) the term “やまとうた (Japanese poetry)” is defined in comparison to Chinese poems, and 2) it is likened to plants, a natural phenomenon. The “Kana-jo” was, in a sense, Tsurayuki’s declaration that Japanese aesthetics were about observing natural changes, of which humans were part. He emphasized that this had to be the guiding principle for Japanese literature to become independent from Chinese influence. Such determination to find beauty in natural changes by carefully observing them was elevated to the notion of “mono no aware.” “Aware” originally meant the “ohh” and “ahh” we let out when we feel joy, amazement, sympathy, sorrow or other intense emotions. And since “mono no” meant “of things or events”, the phrase meant the sources of amazement that were inherently embedded in things or events. The Kokufu (a Japanese style, as opposed to a style influenced by Chinese) Culture during the Heian era is often described as the culture of “mono no aware,” and Ki no Tsurayuki was one of the first who used this term. Because “mono no aware” is elusive, you might miss it if you didn’t have the sensitivity or ability to “observe” it. The aristocrats took pride in training themselves to develop such sensitivity. Tsurayuki used the term in “Tosa Nikki (A journal from Tosa)” to criticize a boatman who kept drinking even when his customer was exchanging poems of good-bye with his family/friends upon his departure. He could not tolerate such lack of “mono no aware” sensitivity. In a sense, being a social elite in Heian era meant a “licensed mono no aware detector” – it was an aristocrat/s privilege/responsibility. It is worth adding that Tsurayuki wrote “Tosa Nikki” using kana letters, pretending to be woman, a deception to allow him, as a man, to pursue Japanese-ness in literature. Such sensitivity flourished in “The Tale of Genji (the Genji),” one of the worlds’ oldest surviving novels written in 1008 by Murasaki Shikibu, an intellectual woman from an aristocratic family. The Genji is often described as a culmination of “mono no aware” literature. The Genji is an extraordinary story of “observation.” Murasaki Shikibu, with her intelligence and kana/feminine sensitivity, intently – sometimes obsessively, sometimes critically – observed and chronicled every detail of love and life of her main character, Hikaru Genji, a handsome, aristocrat, and the people surrounding him. In Heian era, aristocrats lived in “shinden-zukuri” mansions. Those buildings had no walls, and were only loosely divided by screens, partitions or furniture. Women stayed behind those semi-closed shields most of the day, making their existence almost mysterious. Men and women spent enormous amount of time and energy trying to make romantic connections, which were often elusive because of the social separateness symbolized by “open-but-closed”, or “accessible-but-inaccessible” semi-closed shields of the shinden-zukuri mansions. There are no clear conclusions or lessons learned in the Genji. 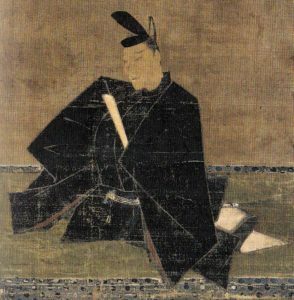 As it is, in the sensuously detailed chronicle of “mono no aware,” reality is often overpowered by fantasy (people “fantasize” a lot about their man and woman when they cannot see them, which happens often), and the absence, loss or failure creates more dramatic effects than success or fulfillment. In one Chapter, Hikaru Genji falls in love with the young wife of an old public servant. She is not particularly beautiful, but he becomes fixated on her behavior. Despite many barriers, Genji tries to approach her, but she eventually refuses the relationship and decides to leave one of her thin gowns on the floor to show her decision. Genji laments and writes a poem likening the gown to an ecdysis of a cicada (there are many cicadas in Japan). The “empty” gown is the climax of the story with this woman: it symbolically augments her mysterious appeal and the painful loss felt by Genji. In connection to the poem, the author named this woman “空蝉 (utsu-semi, or “vacant” cicada)”. Remember, the letter “空” is the one that appeared in the discussion of utsutsu-utsu, and also the notion “kuu” used in Buddhism. But the power of aristocrats did not last long. While they were immersed in the dreamy land of “mono no aware,” neglecting the difficult job of governing a country, military leaders were steadily expanding their influence, using physical force (which is what aristocrats did not have). In 1192, the Minamoto, one of the major military clans in Kanto (around current Tokyo area) took control of the major regions, starting the series of military regimes that lasted for several centuries. It was time for “mono no aware” to change. And the change was influenced by Zen, a school of Buddhism that started to become popular as it was being introduced from China. Zen expanded during this time of period mainly because of its approach, which denied the text and relied on strict physical training such as meditation. It resonated with bushi-do (the code of honor of the samurai). Military leaders supported Zen and sought Zen priests as mentors and teachers. Born in 1192, Teika Fujiwara, a high-ranking aristocrat and a “waka” poet, lived in this era of tectonic transition. As a young genius, he already noted down his determination to devote his life to aesthetic pursuit at the age of 18, shrugging off the brutal military invasions that were starting to damage the security of the Kyoto aristocrats. Teika started the poem by using “looking around”, “flowers” and “leaves.” The readers who try to re-experience the poem try to look around and imagine beautiful colors from flowers and autumn leaves, filling their mind with abundance. But such images are immediately denied, and the readers are suddenly brought to a remote beach where only faint sign of life is felt in the middle of vast nature, as it readies to dissolve in a complete darkness. There is a stark contrast emphasized by “flowers” or “autumn leaves” and their absence (the most impactful word in this poem is “なかりけり”, which means “there are no -“), and also by the almost dark, vast nature and a single, rustic hut. All in all, even after the readers find out that there is nothing abundant in the actual scene, they would still feel the reverberation of the colorful leaves, albeit that it feels like they dissipate in the vast absence. 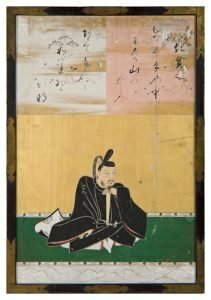 The poems in the “mono no aware” era would have talked about the real flowers and leaves, or their current status of “utsurou.” But Teika brought a completely new perspective in literature, which was to erase the subject of “mono no aware,” and by doing so, let something even more vast emerge. His work is often likened to that of the French symbolists. By boldly exploring new potential in the absence of subjectivity, he definitely set the tone for wabi-sabi culture that followed him.